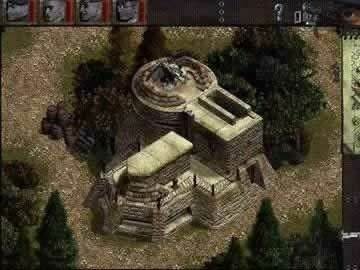 Commandos: Behind Enemy Lines Game Review - Download and Play Free Version! Command a squad of elite troopers in this realistic real time game set in WWII! 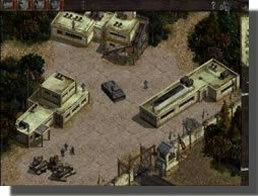 Commandos is an exciting game of clever strategy loaded with hours of realistic combat fighting. In this game, you will control and send a small squadron on hazardous missions of life and death. These missions will be dangerous and action packed so you better be ready for anything! Can you, through clever strategy, bring the squadron back alive after sending them behind enemy lines? This game is about studying your enemy and developing a careful plan. This way when the battle comes, executing the plan to perfection is second nature. This is a real-time tactics game which means scenarios are sure to quickly change! The action in this game is intense and furiously packaged to keep you riveted on the action. You will soon be wondering if you can handle the intense pressure of being a Commando. Enjoy the fact that each Commando will come with a special set of skills. The Green Beret is excellent with a knife and camouflage. The sniper... well his job should be obvious. Demolitions experts can blow things up with skill and accuracy. The Marine is good on land and water. The spy can impersonate Germans. The driver can pilot enemy vehicles so you can have a get away vehicle. The action is intense and the coordination is difficult, but the game delivers hours of adrenaline laced fun! Commandos: Behind Enemy Lines is a real-time strategy war game which continues the series intense and addictive tactical combat. Take control of six different commandos, the Marine, Green Beret, Driver, Spy, Sniper, and Sapper, as you attempt to complete a variety of missions spanning across Europe and Northern Africa. What makes the titles in this series so interesting is the deep strategy and how you must use the special skills of each commando in order to complete the dangerous and difficult missions. For instance, you may have to send in the Spy to distract a guard as your Green Beret sneaks up to silently kill him with your knife or have the Sniper pick off a German patrol so your Driver can sneak in to steal a tank. The levels are linear in design yet open-ended enough that there are several strategies which you can employ to complete your mission which adds to the replayability of the game. 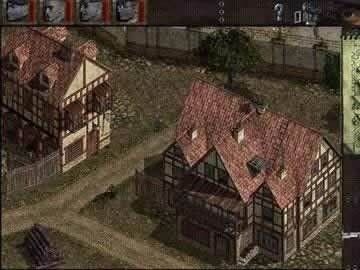 The levels also help to draw you in with the graphics, little details like river dams or enemy barracks, and enemy AI which react in believable and realistic ways. Also, the camera control is easy to use and very useful with the ability to have a split screen view to keep track of commandos spread across the map and tracking cameras which can follow enemy patrols helping you to form your strategy and pull off perfectly timed maneuvers. There are only a few slight issues which might turn off some players to Commandos: Behind Enemy Lines. The first slight issue was that there were the occasional path finding problems while driving vehicles, which did cause many huge problems but was slightly annoying at times. The only other issue was that the levels are quite difficult in many cases and can take several hours to figure out. Keeping track of your entire squad can get rather complicated and seem overwhelming sometimes as well. Overall, Commandos: Behind Enemy Lines provides a very challenging and addicting strategy/action experience that will test your tactical skills as well as a bit of your dexterity and timing. Strategy fans are sure to enjoy the intricate planning and execution of utilizing the teams special skills to overcome obstacles and bring down the Nazi war machine. The difficulty may prove to be too challenging for some, but if you persevere victory is all the more sweet when you see your plans all come together.